Well here we are…the final reveal. As a Lake Louise wedding photographer, I see many different styles of weddings there. This particular wedding inspiration shoot started with an idea, and then a whole group of talented vendors added their creative touches. It truly was a labor of love so be sure to scroll down to the bottom for all of the details. If you’re a bride looking for some vintage inspiration for a mountain wedding, then you’ve come to the right place. Stay tuned next week for instructions on the some of the DIY projects we incorporated into this shoot. Enjoy! Our real couple, Dean & Nadine Adams, for being so easy-going and so fabulous. Nicole Westerlund for designing the stationary products for the shoot. Her “tree ring” theme translated into so many aspects of the shoot. Sarah of Sarah Mayerson Designs for providing our gorgeous florals. Catherine at Great Events for the elegant chiavari chairs, linens and tableware that added to our “wedding-scape”. 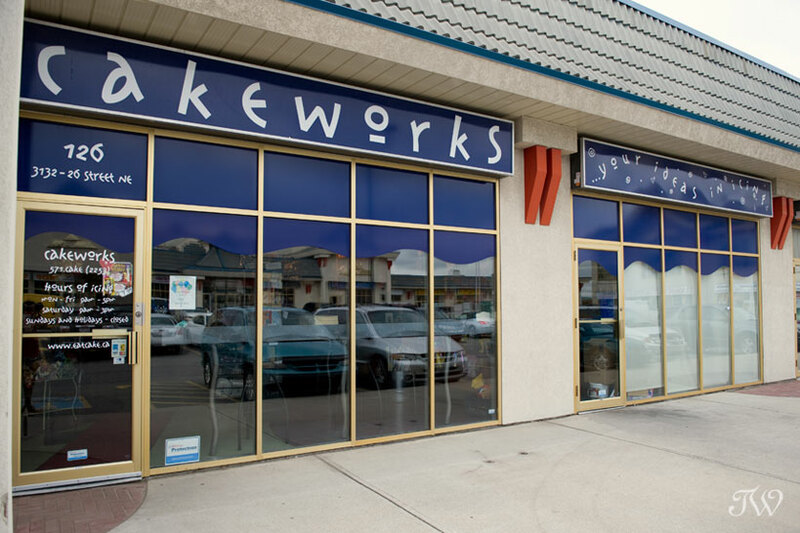 Cakeworks for providing the beautiful wedding cake. 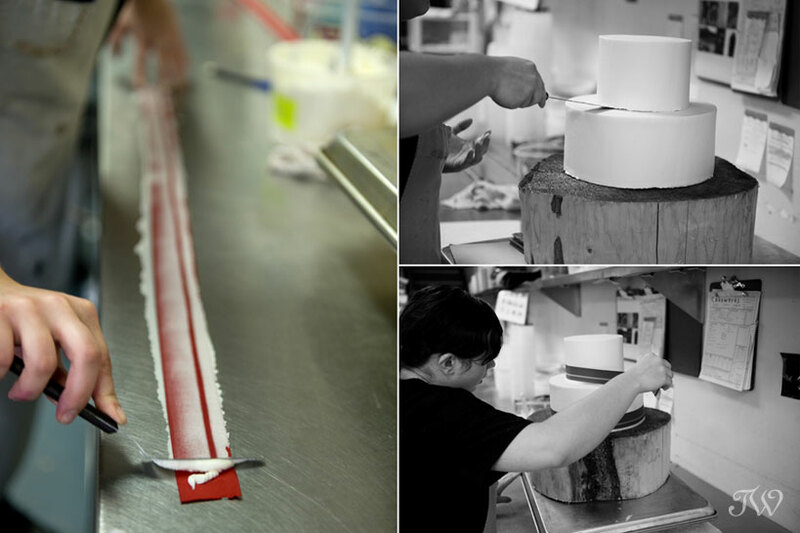 Read all about the cake-making process here. Paradise Lodge for allowing us to do some shooting at their lovely facility. Their quaint little mountain cabins were at the heart of the inspiration for this shoot. Other locations: Chateau Lake Louise & a private residence. My assistant Carol, for working tirelessly on this project. A while back, I was invited to spend the morning with this Canmore family and meet their new baby, Varden. Doesn’t he look like his Dad? This was not the first time I’ve photographed them. What fun to see how things have changed in the last year. Check out their sneak peek here and don’t forget the slide show at the end. Enjoy! Welcome to part 2 of our mountain wedding reveal. 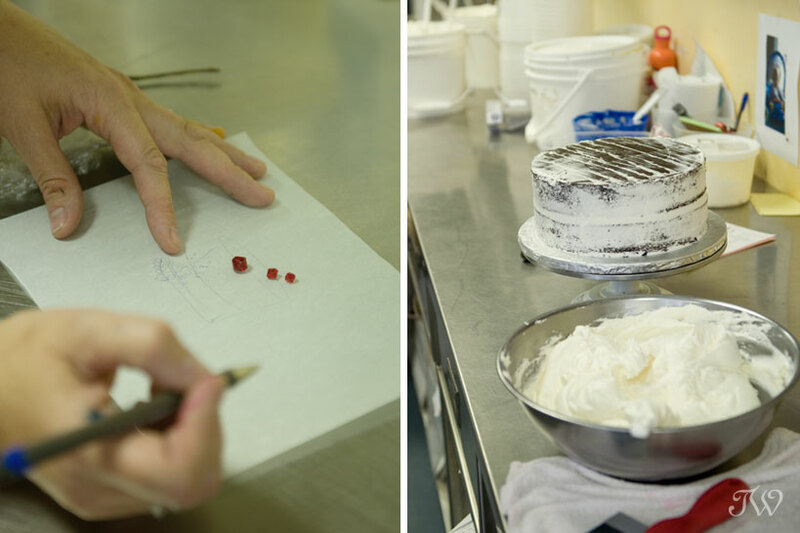 Part 2 involves vintage wedding cake. 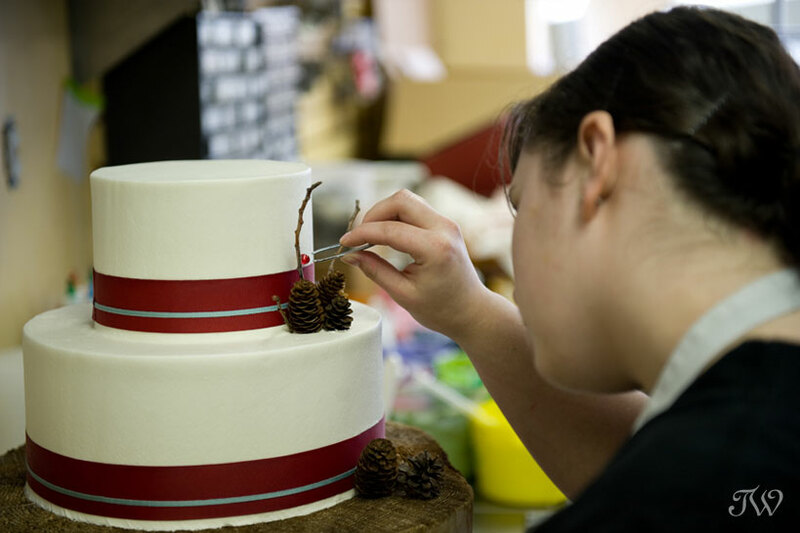 I was thrilled when Brenda from Cakeworks jumped on board with this project. 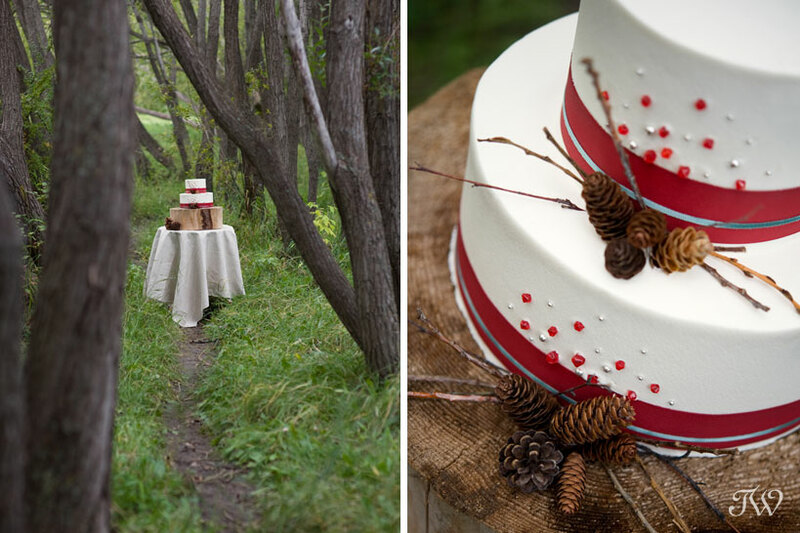 She & Nicole saw the inspiration board and came up with an incredible cake. An unexpected part of this project was how people saw the same inspiration board and came up with fantastic ideas that I wouldn’t have even imagined. 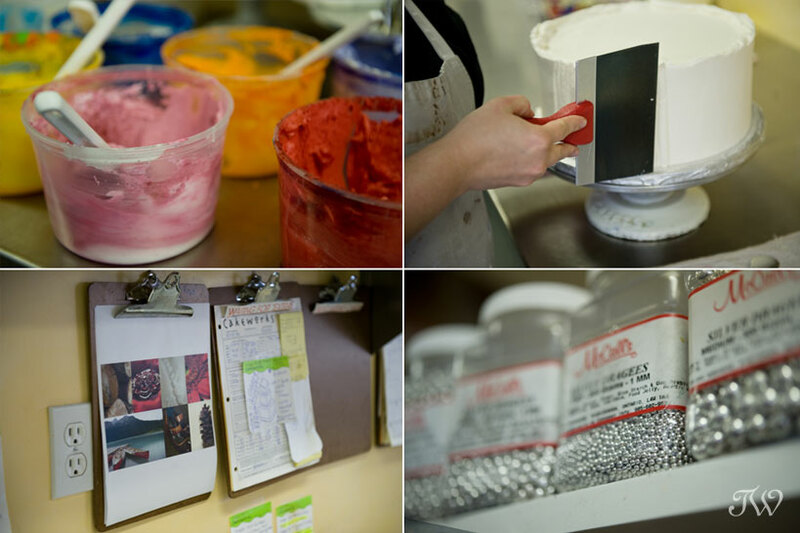 Cakeworks allowed me to see the inner workings of the bakery and document the cake-making process. I spent the afternoon with Athena while she took the sketches and made them reality. It was like our own little episode of Cake Boss. Thanks to everyone at Cakeworks. 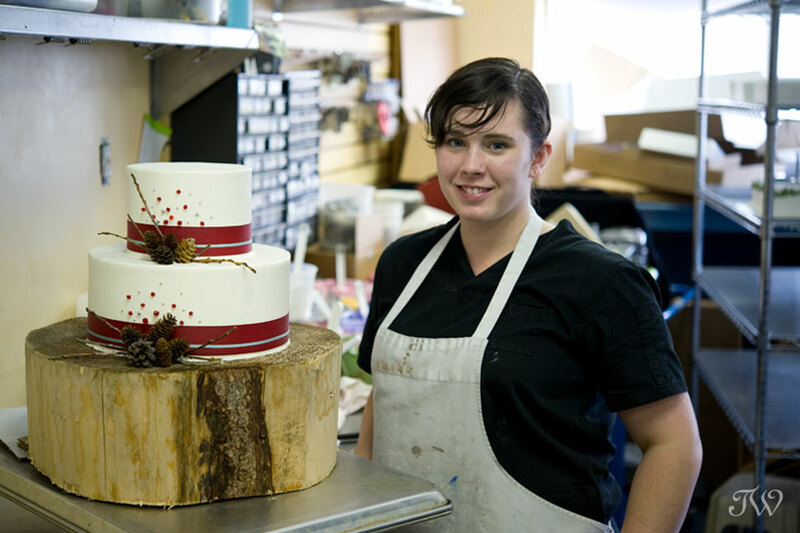 If you’re in the market for a wedding cake, be sure to check them out. PS: Special thanks to my Pops. Brenda and I were brainstorming and she said “wouldn’t it be cool if we used a tree stump as our cake stand”? The next day, my Dad hauled out the chainsaw and made it happen. 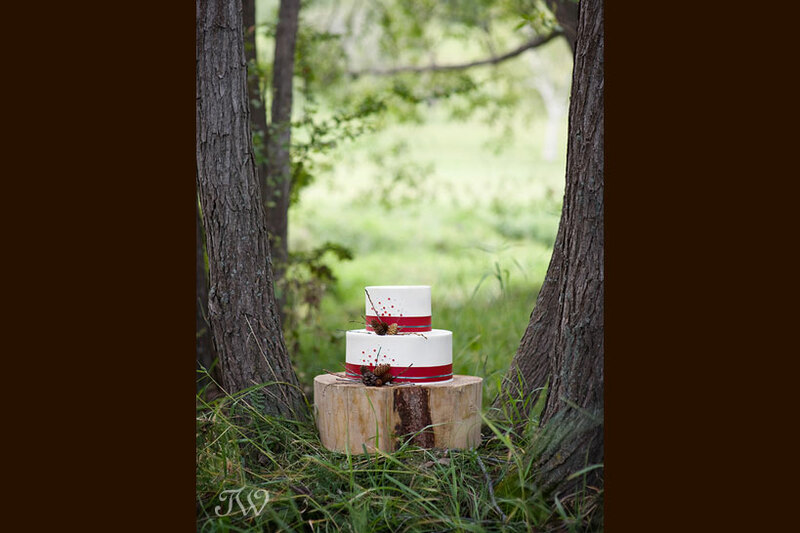 Thanks to Nicole Westerlund for helping us haul the cake into the woods to take beautiful pictures. Today I’m excited to unveil the first installment of a project that I’ve been working on for several months, in collaboration with some amazing Calgary wedding vendors. I had the idea to do a styled wedding shoot with a “Vintage Mountain” theme and what better place to start than at the beginning. This is the inspiration board for our shoot. If you follow my blog, you know that I’m an inspiration board junkie. It’s just a great way to pull together and visualize all of the ideas you love. I hope you’re hooked now and will stop by tomorrow for part 2 of our vintage mountain wedding. I look forward to meeting some great couples. Contact the studio right away for details.